California Blacke-Eye #5 Pea | Gurney's Seed & Nursery Co.
Vining-type plant continues producing pods over a long harvest period, often right up to frost. It takes experience to judge the best time to pick for use as green shell peas, but the straw-colored dry pods are easy to distinguish when harvesting for dry bean storage. Soak overnight to reconstitute. Easy to shell as a dry bean, but not the easiest to shell for shell peas. Spacing1 - 4 inches between plants and 24 - 36 inches between rows. 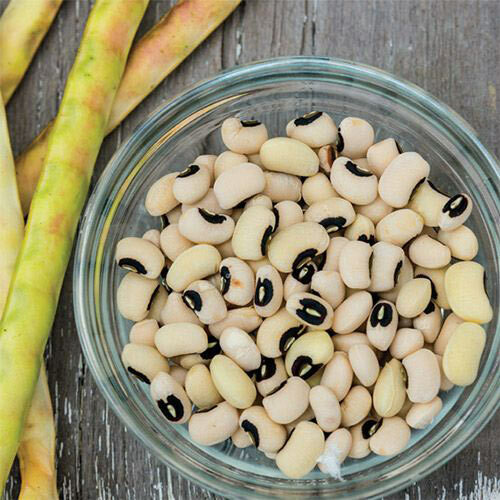 FruitPeas have black markings and delicious flavor. Soil RequirementsDeep, rich, fertile, sandy soil. Seed Count1/4 lb. is approximately 400 seeds, ( sows a 50 ft row) and 1 lb. is approximately 1600 seeds. CommentsDisease resistant. Smooth, large pea. Vigorous. Heavy yielding. Considered best of all black-eyed peas. 6 - 9 peas per pod. Yield100 pounds per 100 foot row. Botanical NameVigna unguiculata 'California Blackeye #5'; Family: Fabaceae/Leguminosae (Bean Family). Depth1/2 - 1 inch deep.